Welcome to our complete guide to the best food for a Miniature Schnauzer dog. These charming little dogs are full of attitude and character and make great companion pets. They are also lively creatures who just love to play with other canines or enjoy a game of ball in the park with their owners. These stocky little livewires thrive on a diet that includes plenty of protein for muscle development and carbohydrate to provide all the energy they need. However, it can be tricky to find the right diet to suit your Miniature Schnauzer, as these dogs can be prone to pancreatitis. Triggers for this condition include high levels of triglycerides (fats) and cholesterol in the dogs’ systems. Some Miniature Schnauzers can also develop food allergies, which may make it a challenge to find a food that suits them. Some Miniature Schnauzers are also inclined to be fussy feeders. Like other small breeds, Miniature Schnauzers can be prone to developing canine periodontal disease, because their teeth are often overcrowded. Dental overcrowding predisposes small breeds to accumulating pockets of bacteria and plaque between their teeth, ultimately leading to periodontal disease. You may never have a problem with your Miniature Schnauzer’s diet, but it’s still advisable to select a diet that suits their sensitive digestion. If you have specific concerns about your Miniature Schnauzer’s nutritional needs, ask your vet for advice tailored perfectly to them. If you’re looking for feeding ideas for an otherwise healthy dog, we hope this overview of the best dog foods for Miniature Schnauzers and their puppies will be helpful. What is the best food for a Miniature Schnauzer? Because Miniature Schnauzers can be prone to pancreatitis, it’s important that you feed a low-fat diet. In addition, this breed can develop diabetes if they become overweight so it’s important not to overfeed your pint-sized pooch! If your pup will eat it, dry food is a good choice, as this helps to scrape away plaque. Add a low-fat dental chew to your dog’s daily diet to make sure his teeth stay plaque-free and keep periodontal disease at bay. Avoid feeding your Miniature Schnauzer too many treats, no matter how appealing those eyes are! This breed is inclined to become overweight, potentially risking health conditions such as diabetes and joint problems as they get older. So, what’s the best food for Miniature Schnauzer? If you’re looking for a dry food for your Miniature Schnauzer, we don’t think you can go far wrong with one of these tasty choices. Royal Canin make one of the most popular dry dog foods for Miniature Schnauzers that’s on the pet food market today. This breed-specific diet contains extra-small kibble, specially formulated to tackle plaque and tartar, and it’s also low in fat. This food is designed for Miniature Schnauzer dogs of 10 months and older. It comes in a convenient 2.5-pound bag or a 10-pound bag for owners who have multiple Schnauzers in their household! Another of the best dry dog foods for the Miniature Schnauzer is made by pet food giant, Purina. Purina’s small breed formula dry dog food is formulated to meet the dental, kibble size, and nutritional needs of the Miniature Schnauzer. You can choose from 6-pound, 18-pound, and 34-pound bags. If you prefer to feed your Miniature Schnauzer a grain-free diet that’s also low in fat, you might want to try Wellness CORE Natural Grain Free Dry Dog Food. This wildly popular reduced fat formula is also rich in protein and made from all natural ingredients. As Miniature Schnauzers can be fussy feeders, you may find that your pup prefers a combination of dry and wet food. Begin by feeding a combination diet of 25% wet food to 75% dry food. Ask your veterinarian’s advice on portion size and for guidance on adjusting the amount of food your dog should have as he matures. Cesar’s variety pack contains 40 3.5 ounce trays of wet dog food in a variety of different flavors, including poultry and steak. This extremely popular wet food brand is specially formulated and balanced to suit small dogs and fussy feeders. Vitamins and minerals are added to the recipe, potentially saving you money on separate food supplements. Hills Science make a wide range of special-diet dog foods, including one for small breeds. The recipe is formulated to help maintain lean muscle and an ideal body weight. The food is also easy for small breeds to digest, making it suitable for Miniature Schnauzers with sensitive stomachs. The 8-ounce cans come in a 24 pack. If you are lucky enough to have a cute little furbaby to feed, it’s important that you start off on the best foot. This means feeding the right diet that addresses the special nutritional needs of Miniature Schnauzer puppies. The following Miniature Schnauzer food for puppies has your baby covered! This dry food is specially formulated with small breed puppies in mind. It offers a balanced, complete diet in a small kibble size and has added salmon, containing DHA (an omega-3 fatty acid) for healthy brain and eye development. Made in the USA, Wellness foods contain only best quality, natural ingredients with no grain, meat by-products, colors, preservatives, or artificial flavors. IAMS puppy and toy breed dry food is perfectly designed with small kibble pieces specially for little mouths. Tasty chicken is the main ingredient, and the food also contains added omega-3 DHA to support healthy brain development. Antioxidants are added to help your Miniature Schnauzer puppy develop a strong, healthy immune system. IAMS puppy food contains no grains, no fillers, no preservatives, and no food colors. The product comes in 3.3-pound, 6-pound, 7-pound, 12.5-pound, 15-pound, and 30.6-pound bags. Miniature Schnauzers can be afflicted with sensitive stomachs. The best Miniature Schnauzer food for dogs with food sensitivities or wheat allergies is one that is specially formulated to avoid causing stomach upsets. Dogs with sensitivity and food allergy issues will benefit from products containing only natural ingredients, and the following two diets fit the bill. Solid Gold Holistic foods come in dry and wet form; perfect for fussy eaters! This food is also suitable for all life stages, from a Miniature Schnauzer puppy right through to senior dogs. The recipe is gluten-free and contains 20 nutrient-dense superfoods to provide your pet with a powerful source of natural nutrients and vitamins. The food is made from easy-to-digest chicken and fiber-rich pumpkin, making it perfect for pets with sensitive stomachs. Levels of fat, fiber, and protein are carefully measured to cater for the unique nutritional needs of small dogs. The food does not contain fillers, grains, or artificial preservatives. Solid Gold is made in the USA. Hill’s Diet Sensitive Stomach and Skin is formulated for small breeds of dogs that have sensitive stomachs or skin allergies. The diet includes prebiotic fiber made from beet pulp, helping to keep the digestive system moving and prevent diarrhea. Hills gives your Miniature Schnauzer easily digestible, high quality food that contains no artificial flavors, colors, or preservatives. Omega-6 fatty acids and vitamin E are included in the recipe to promote a shiny coat and healthy skin, whilst a blend of antioxidants with vitamins E and C help to support your dog’s immune system. Many dogs demonstrate a sensitivity to the gluten that many standard diets contain. 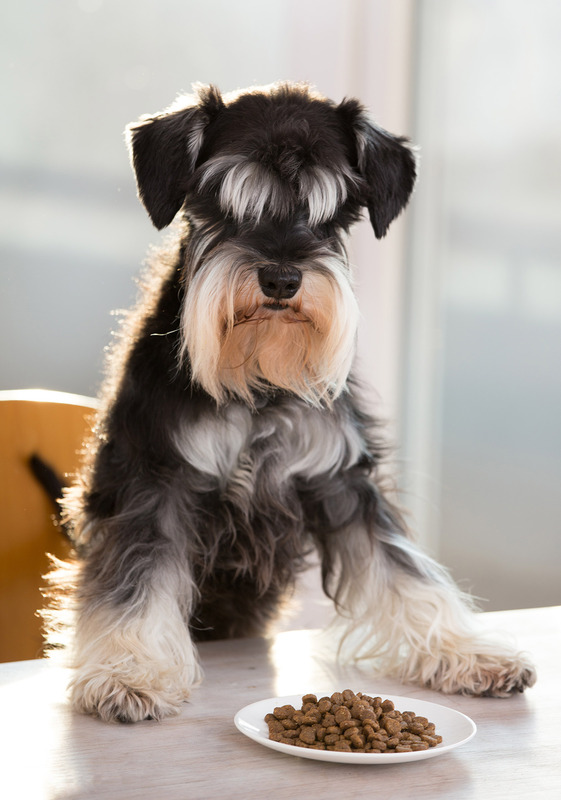 For Miniature Schnauzers of all ages, a grain-free diet could therefore be a good choice. There are plenty of excellent grain-free products available for your pet, some of which we’ve already mentioned. Here are a couple more that you might like to try. Purina are a very popular manufacturer of high-quality dog food. Their grain-free range of dry products is made with natural ingredients, plus added minerals and vitamins. High chicken content ensures that your Miniature Schnauzer will get all the protein and amino acids he needs. Purina’s nutritionists oversee their recipe formulation processes, and over 680 safety and quality checks are carried out on the food. Purina’s grain-free food contains no soy, corn, or wheat. The food is available in 3-pound, 13-pound, and 23-pound bags. Nature’s Recipe are a lesser known but still very popular maker of high-quality pet foods, including a grain-free small breed dry diet that would be a suitable Miniature Schnauzer food. The recipes come in a variety of appetizing flavors, including chicken, lamb, and salmon so there’s something to suit every taste. The food contains high-quality protein to help maintain muscle health, and also contains pumpkin and sweet potatoes to provide tasty grain-free sources of carbohydrate for energy and vitality. This all natural formulation contains no grains, but does have plenty of added minerals, vitamins, and nutrients. This food is also available in a puppy-specific recipe. Just as Miniature Schnauzer puppies have special dietary requirements, the same applies to seniors. Miniature Schnauzer food amount measurement is especially important in seniors to make sure that they don’t become overweight whilst still receiving the nutrition that they need. As dogs age, they can be affected by osteoarthritis in their joints, making your faithful friend less active. In addition, older dogs are sometimes more susceptible to illness and they do benefit from increased immune system support. We’ve picked out these two foods that you might like to try, which are specially formulated to meet the nutritional needs of senior Miniature Schnauzers. Wellness make a dry food that is specially designed to meet the needs of small breeds as they reach their golden years. Complete Health offers a balanced, complete everyday diet for the senior small breed dog. Smaller kibble size pieces are packed with delicious deboned turkey to tempt the fussy feeder, and added chondroitin and glucosamine to help to keep your senior Miniature Schnauzer’s joints supple and healthy. This food is made with all natural ingredients and contains no grains, meat by-products, artificial preservatives, flavors, or colors. Wellness foods are manufactured only in the USA and they also offer a guarantee of quality. Nutro Ultra offer a small breed senior dry dog food, ideal for Miniature Schnauzer pensioners. Nutro Ultra is formulated to support your dog’s teeth and immune system. The recipe contains high quality protein, healthy whole grains, as well as a unique blend of superfoods and other nutrients. Three proteins are derived from salmon, lamb, and chicken in every healthy portion. No preservatives or artificial flavors are added to the food, and they contain no wheat, corn, or soy. The formulation is designed to support a healthy coat and skin, a strong immune system, heart and digestive system health, while maintaining vitality and energy. Every owner wants to provide the best possible health and lifestyle for their Miniature Schnauzer friend, and this all starts with the right diet. Just like people, every dog is different, and you may find that you have to try a few different foods before you find the one that best suits your pet. Remember that your Miniature Schnauzer puppy’s needs will change as he grows up and that his nutritional requirements will alter too. 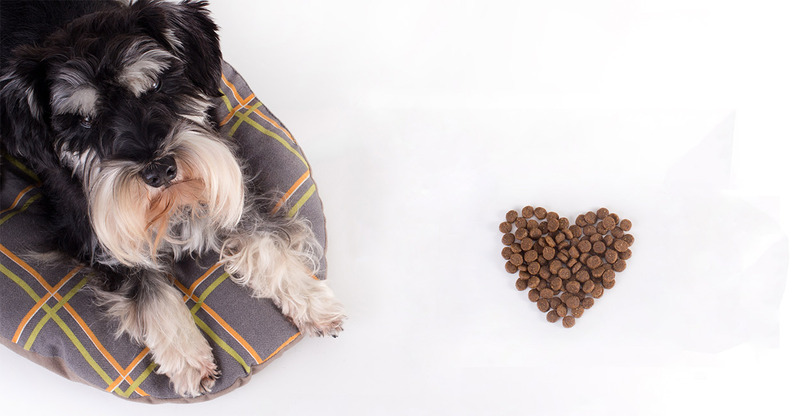 What Miniature Schnauzer food can’t your pup get enough of? Tell us which meals are a hit, and find out what’s in the dinner bowl for our other readers’ dogs over in the forum! Jennifer L. Garcia, DVM, DACVIM, “What’s the relationship between hypertriglyceridemia and pancreatitis in miniature schnauzers?” DVM 306, 2011. R. B. Ford, “Idiopathic hyperchylomicronemia in miniature schnauzers” Journal of Small Animal Practice, 1993.